« Wow, you mean there are others? You will first need to design the layout of your system. I decided where and how many sensors to place. You’ll also need to figure out how to connect all of these sensors – can you hardwire them or will you need to go wireless? For break-in protection I monitor my doors and cover the rest of the house with Passive Infrared sensors. I’m much more concerned about someone breaking in when we are not home so I decided to skip the window and glass break detectors. Doors and Windows are ‘perimeter’ zones that you can use for security when you are home, like at night. Everyone said that Infrared is the most foolproof so I added more of these to cover all of the likely spots. You might be able to get into my bathroom through the window, but as soon as you moved into the house I will detect you. Another encouraging detail I discovered early on was that the system will also monitor my smoke detectors and call the fire department if needed. Placing Smoke & CO detectors also need to be planned in your installation. One system that kept popping up as being both versatile and very popular was the Honeywell Ademco Vista 20P. They offer a wireless receiver that can be mounted in the control box. Wired sensors are pretty standard and mostly interchangeable between brands. The Wireless sensors all need to work with a specific Receiver board – you are locking yourself into a single brand & model range with wireless. Fortunately the Honeywell wireless system for the Vista controller is very versatile and offers a wide variety of sensors that all work together. I started ordering parts. They don’t really seem too expensive individually, but the costs add up quickly when you are purchasing a lot of sensors. You can expect to spend around $1000 for the basic parts as I’ve described and more if you go in for any extras. When my parts arrived I started to assemble the system on my workbench with very short wires so I could test it. This was a very smart thing to do as I really needed some time to figure out how everything worked. It also made the programming easier. This phase of the project was where my ignorance was revealed and where I needed to get answers to my many questions. I studied the installation and programming documents, but sometimes they leave things out or don’t explain things enough for the DIYer. The forums I mentioned above and the tech support from the store were godsends. After I had everything working on the bench I started to pull cable through the house (mostly basement and a few to the first floor). Consider buying the cable you need from the store. I had a hard time finding anything other than 5 conductor cable locally. I mounted the alarm panel and started reconnecting everything permanently. One comment I kept seeing was that most DIYers don’t do a good job with their alarm panel placement. They are often out in the open, too exposed. It needs to be accessible, but not easily found. I’d also add that your cable runs can be like a roadmap back to the panel if you aren’t careful about placement. I have so much CATV and Coax running through my basement floor joists my security system cables are well camouflaged. After thoroughly testing things out once the installation is complete, your final step is to hook it up to your phone line and get the monitoring company to activate your system. They need to call into it and program it for your account. 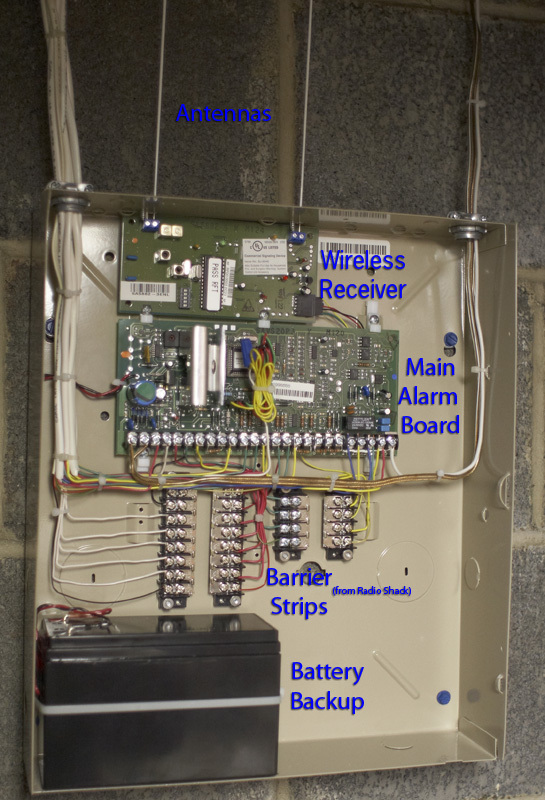 I spent around a month on this project and would only recommend a professional alarm system installation like this to someone with a good knowledge of electronics and the normal DIY skills. There are other simpler alarm systems that may meet your needs and skill set if this project seems too daunting. This entry was posted on 8 August 2009 at 12:56 pm	and is filed under Technology. You can follow any responses to this entry through the RSS 2.0 feed. You can leave a response, or trackback from your own site. Posting your sensitive electronics in a lockbox like this is a great Idea. I recently came across a video surveillance dvr that is housed in the same type of thing. If you didn’t know what it was, you’d just think it was another electric or utility box mounted to the wall. Bryce that is the Case the Honeywell Ademco Vista 20P comes in. It’s all pre-drilled for the mounting points on the circuit board. I only added the barrier strips. Mine is just next to a cabinet whose door is always open. The door hides the box, but allows easy access. The barrier strips are bridged across all of the terminals. A single wire is connected to the board and the barrier strip. The bridging makes the connection to all of the incoming wires. You would have to do something, because all of those incoming wires would never fit under the single screw on the board. The barrier strips seemed like a nice, neat way to do this. Each incoming wire has it’s own screw connector. Thanks! Yeah, looks like you used some fairly thick gauge wire. I can see why they wouldn’t go under the screwdowns. I used 22/4 stranded for most of my wiring and it’s not nearly stiff enough to get the bends like you have. I also wired mine in series so that 1 zone would have 1 pair of wires to the can even if the zone were 3 sensors. I found the same thing I was better off using a self install security system.The problem I am having is how to set all the censors up correctly.Can anyone give me some advice? Skip – I’m probably not the right person to ask. All of my doors are wireless. I can’t remember all of the details of my installation. It’s been working well, but I did have to replace my backup battery.